Federal Insurance Contributions Act (FICA) taxes are deducted from an employee’s paycheck each pay period. Commonly referred to as Social Security taxes, there are actually two separate taxes: the Old-Age, Survivors and Disability Insurance (OASDI) tax and the Medicare Hospital Insurance (HI) tax. 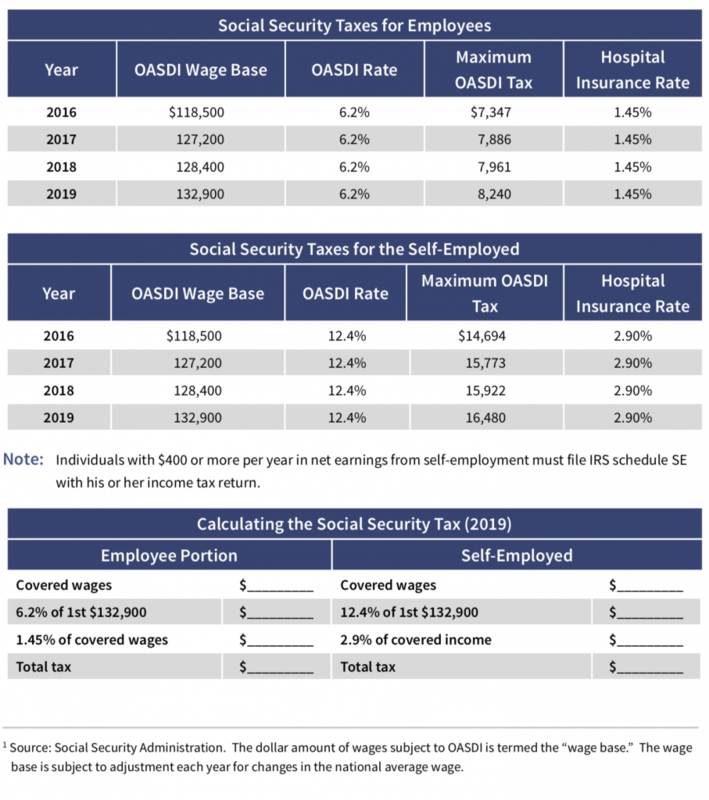 For calendar 2019, OASDI applies to the first $132,900 of wages.1 HI is 1.45% of all wages. 0.9% health insurance tax: Taxpayers with incomes above certain thresholds pay an additional HI tax of 0.9%. For an employee, the additional 0.9% effectively increases the HI tax from 1.45% to 2.35% on income in excess of the applicable threshold. For self-employed taxpayers, the additional tax of 0.9% effectively raises the HI tax rate to 3.8% of net self-employment income in excess of the applicable threshold. For self- employed individuals, the additional 0.9% tax is not deductible. The thresholds are $250,000 in case of a joint return (the earnings of both spouses are considered) or a surviving spouse, $125,000 in the case of a married individual filing a separate return, and $200,000 for any other taxpayer.